The star and three of his brothers - Marlon, Tito and Jackie - are returning to the stage as The Jacksons, almost three years after the King of Pop died. Jermaine said: "The brothers don't know this, but I've broken down several times and cried during rehearsals. I'm so used to Michael being on the right and then Marlon, Jackie, on and on. It's just something we never get used to." The brothers are launching their Unity tour today (Wednesday), five days ahead of the third anniversary of Michael's death from an overdose of the anaesthetic propofol on June 25, 2009. "For me, this cycle that comes around every year - this day, that day - that doesn't affect me because it affects me every day," said Marlon. "When that day comes around, it's the same. You learn to live with it. I still wake up sometimes and go, 'Jeez. I can't believe my brother's not here'." 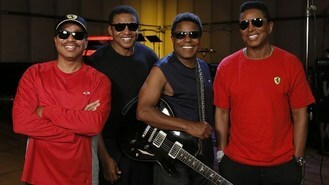 Following Michael's death, the four brothers appeared in a reality TV series The Jacksons: A Family Dynasty, which chronicled their loss and attempt to stage a comeback. Jermaine said the brothers have wanted to reunite on their own for years, but after Michael's death they needed time to heal - and the tour is another step. He revealed the group will pay tribute to Michael during their shows with a medley that will conclude with the tune Gone Too Soon. While various combinations of the brothers have reunited to perform over the years, this tour of the US will mark the first time the brothers have been on the road together since their Victory outing in 1984.